Looking for a new bluetooth speaker? 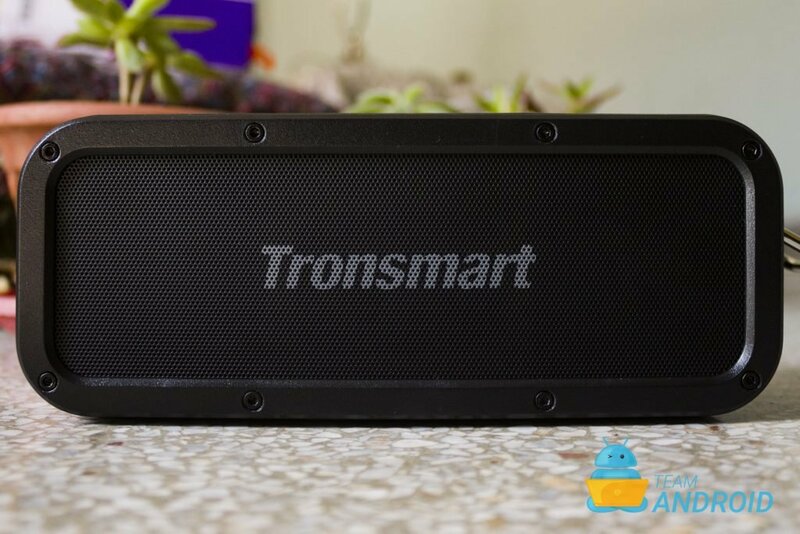 Before buying anything, read our full review of the Tronsmart Element Force speaker. 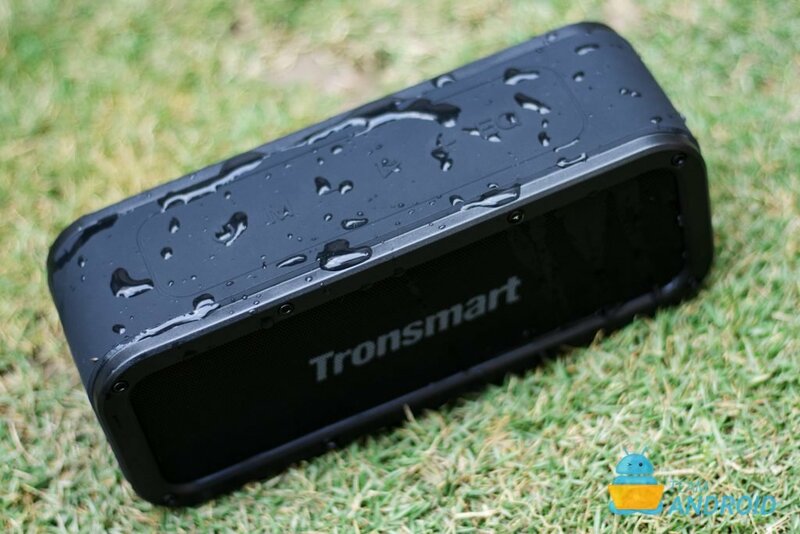 This is a water-resistant wireless speaker with great sound! 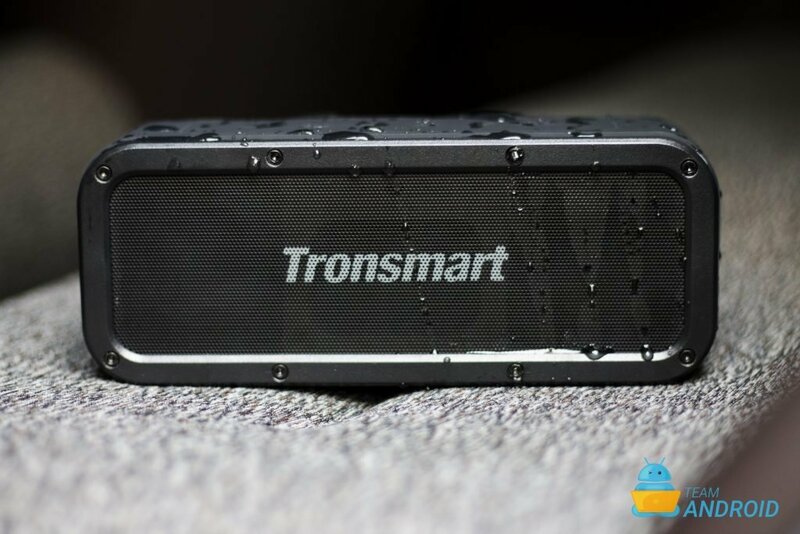 Here is our complete review of Tronsmart Element Force Bluetooth speaker. 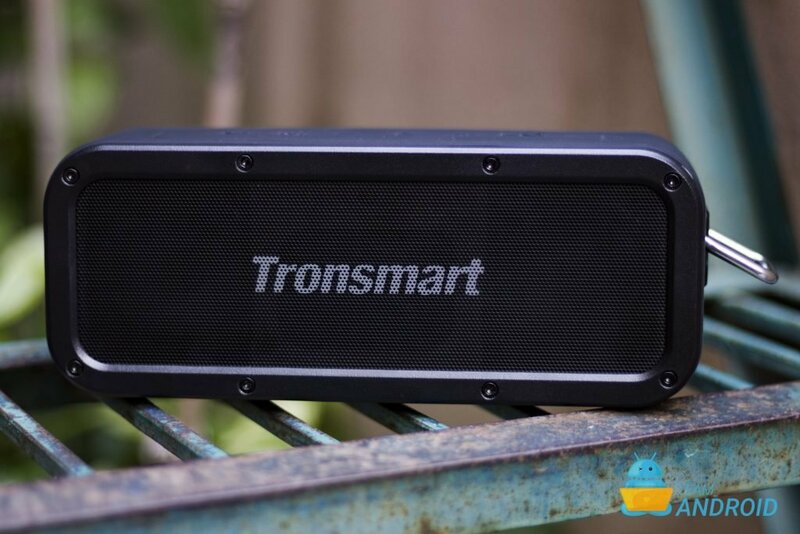 Pushing the envelope of bluetooth audio, Tronsmart Bluetooth Element Force speaker has recently been added to the growing Element lineup. 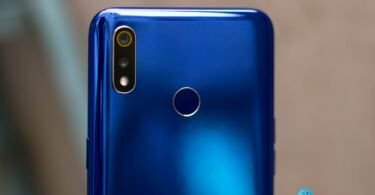 Unique to Element Force is its 40W maximum audio output whilst still holding IPX7 waterproof rating. The market being flooded with bluetooth speakers, it is often difficult to deduce whats the best choice. 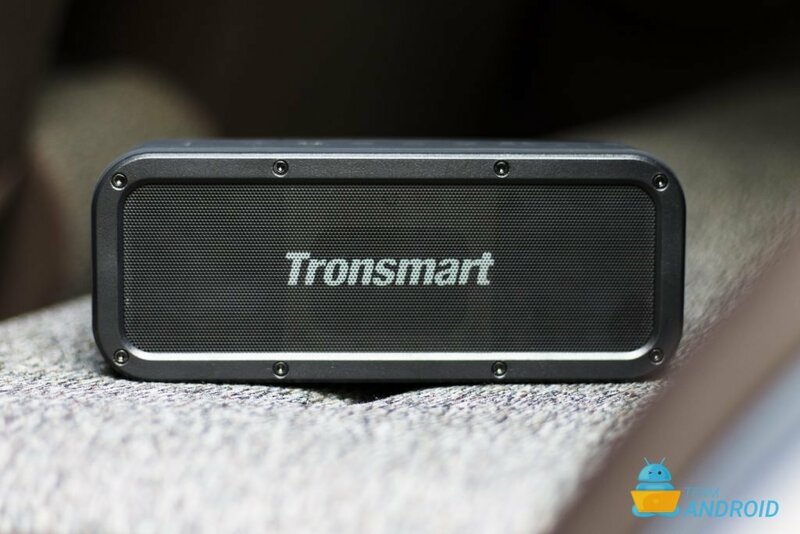 To make it easier for readers to decide, we have discussed the Tronsmart Element Force speaker in detail within our complete review ahead. 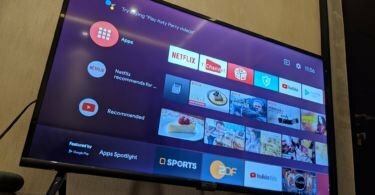 Tronsmart is one brand that we are quite familiar with. 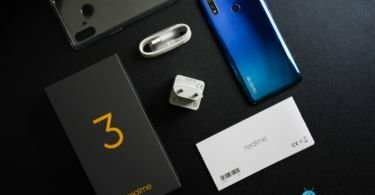 Through its diverse lineup of products such as Brio Power Delivery charger, Encore Wireless Earbuds and Element Mega speaker, the brand has truly shown itself to be capable of developing some amazing products. 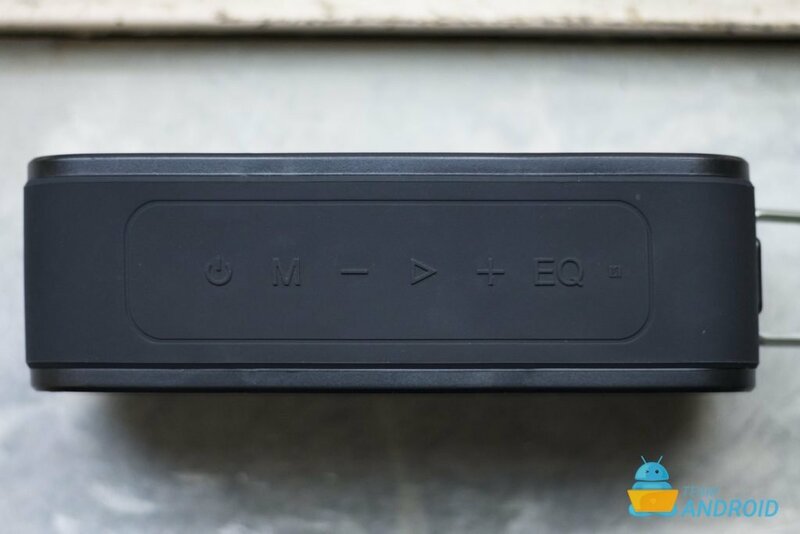 As for the Element Force, it sits as a more rugged speaker offering, designed to withstand splashes and visits to the pool. 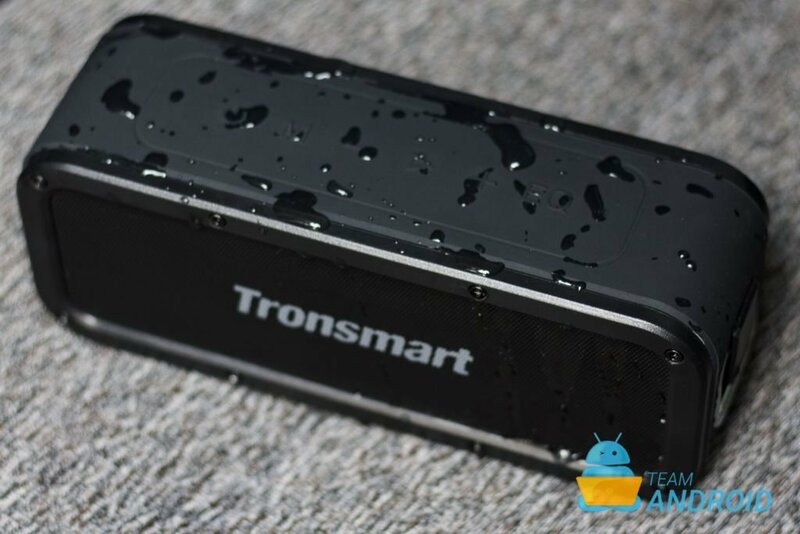 Unlike other brands, Tronsmart ships its Element Force in a well thought out box. 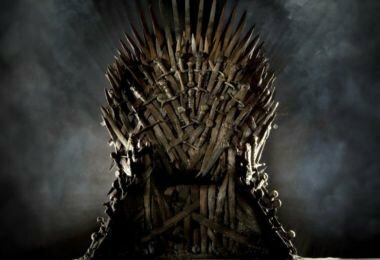 Within it, there is the speaker itself which comes charged to 100, allowing it to be used right away. Further, there is a accessories box which has a USB Type-C to USB-A cable for charging, a 3.5mm headphone cable and the warranty card. 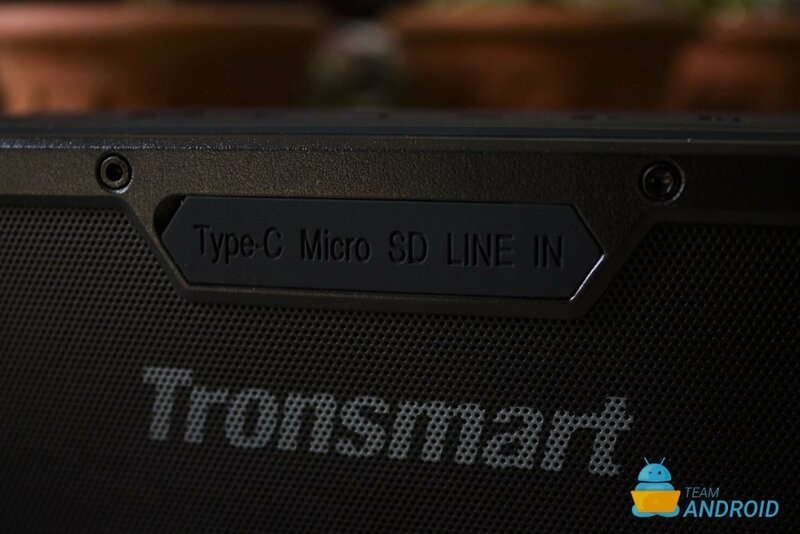 We are glad Tronsmart took an extra step to add USB Type-C port to Element Force. 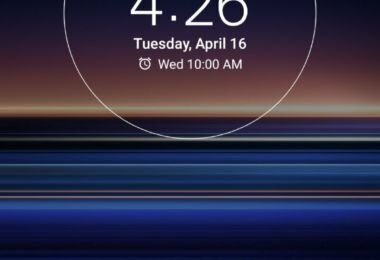 Not only is the port reversible but as growing products such as smartphones and laptops adopt it, users would no longer be required to carry multiple cables and chargers for different devices. Rest, the box itself features Tronsmart’s white, purple and orange color scheme. It also lists key features of Element Force. 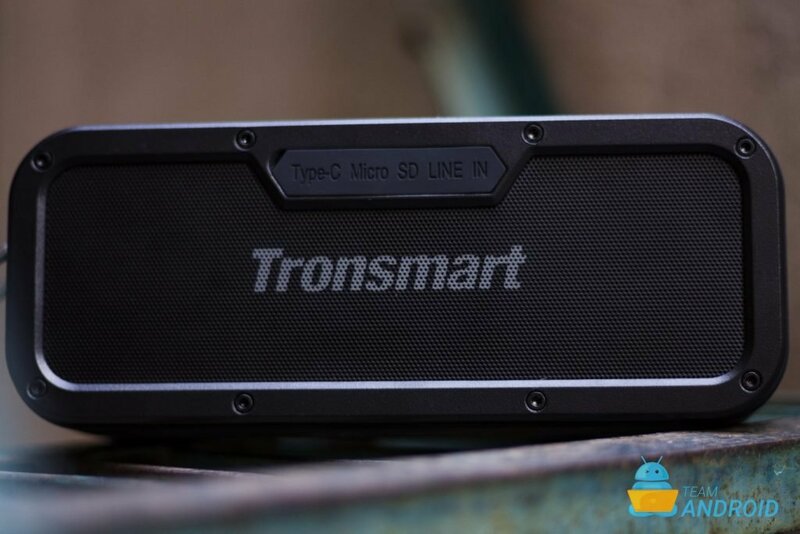 The goal Tronsmart had with Element Force was to create a rugged speaker that delivers quality while also being able to withstand rough usage. The design philosophy also clearly reflects this. 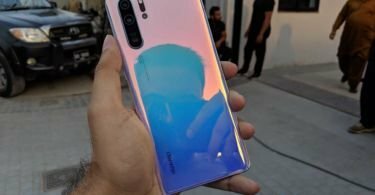 There are Exposed screws on the front and rear and a rubberized coating that follows the whole width of the enclosure. Unlike Element Mega which had touch controls, the buttons on top are physical as touch buttons become unresponsive when exposed with water. There are two LED lights up top as well. One is situated right above the power button and the other above the EQ. First LED is there to communicate whether the speaker is on, is in pairing mode or different charging representations. Whereas the second one above the EQ is to represent whether the speaker is equalizing the content it is receiving. For speakers, there is generally not much playing space that manufacturers can tinker around in. 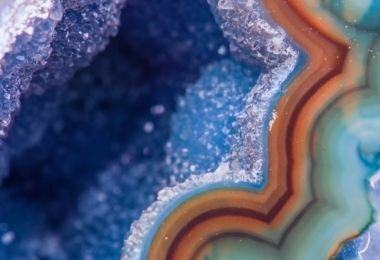 However, Tronsmart’s approach is commendable as the Element Force is both unique and practical. One key design feature is the metal hollow square provided on the right side which allows users to hang it with a harbinger. While the weight of the speaker demands a strong hanging point, this feature adds to the design and makes Element Force stand out. Situated on the rear are the speaker’s main connections. There is a USB Type-C port for charging, support for MicroSD and an auxiliary 3.5mm audio input as well. 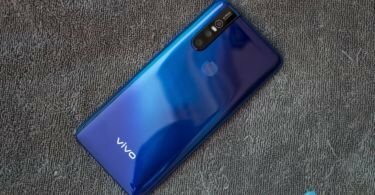 What didn’t make the cut is a USB Type-A port which some users might miss but as the main focus is bluetooth audio, it really isn’t a problem. To maintain IPX7 waterproof rating, these connections are deep within speaker and also have a solid rubberized cover which acts as a direct seal. 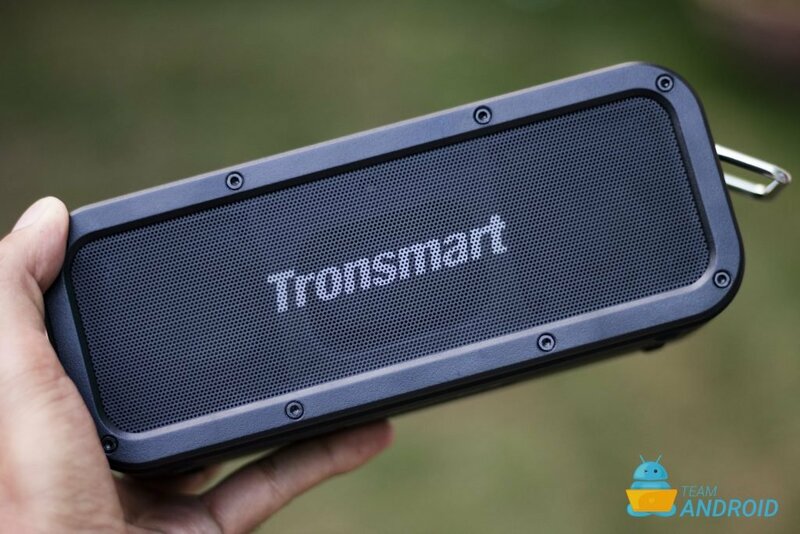 For Element Force, Tronsmart has tried to pack the best speaker modules. Starting with the specs, there is 40W of maximum output from it. 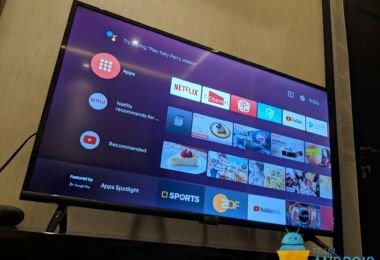 To put it in perspective, some modern TVs only come with 20W speakers. Loudness is absolutely no issue. In fact, full volume is quite loud for closed spaces which is a good thing as there is power when you need it. Outdoors, the sound is just as good. Naturally, you would have to crank up the volume as when compared to indoors. Covering loudness, the next question is about the quality of sound. 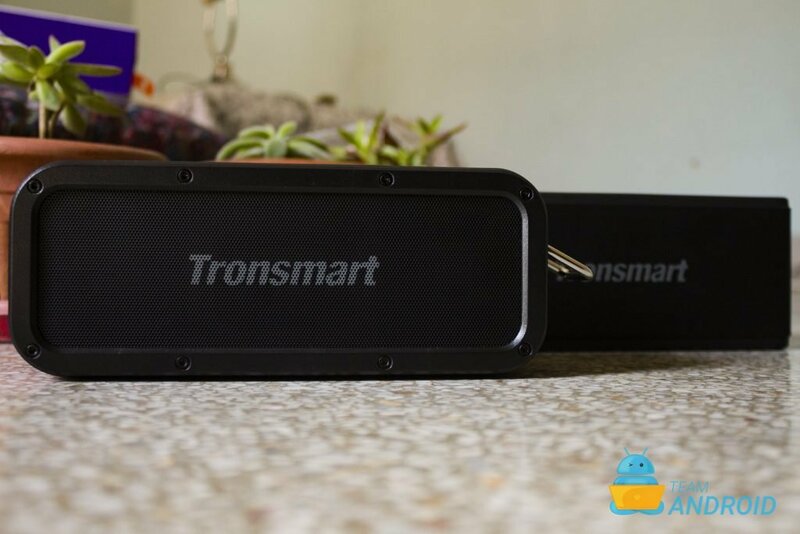 For starters, Tronsmart has tuned its speakers to provide deep bass making Element Force to perform extremely well in the lows. For highs, there are individual tweeters on each side of the woofer — front facing. These provide a nice stereo effect while also maintaining good representation of highs and mids. 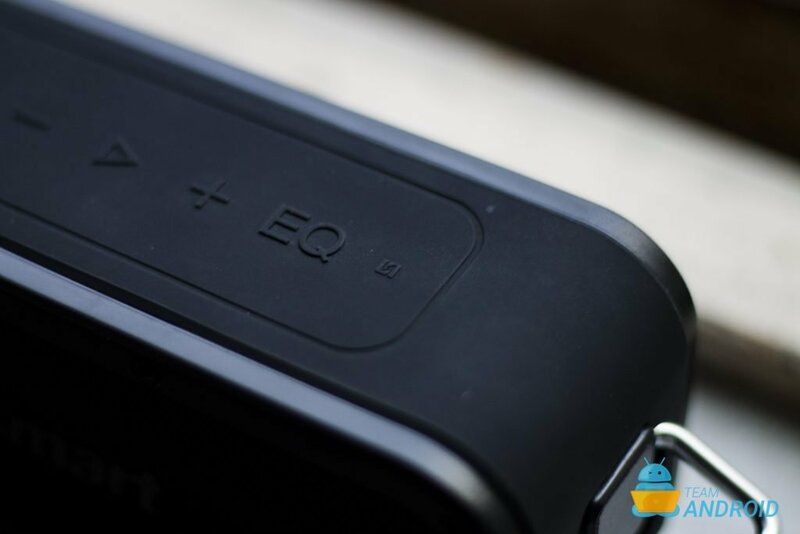 For even more accurate stereo, it also has wireless pairing which allows for a secondary speaker connection hence giving a more pronounced stereo effect. 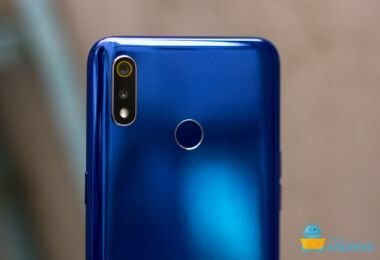 For Element Force, the main selling point is its IPX7 water-proof rating. 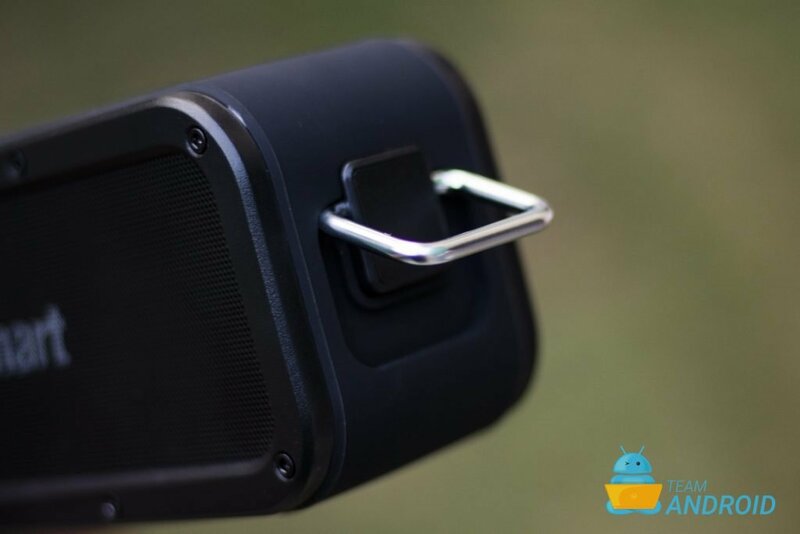 This speaker is perfect for outdoor usage especially near water such as beaches, pools. Most products usually come with a splash / water resistant rating but Element Force can even withstand immersion for a limited period of time thanks to being IPX7. 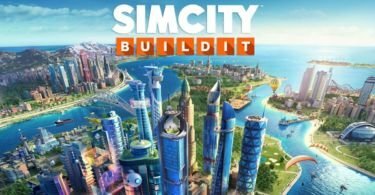 We tested this rating and can report it works just as marketed. Even when there is water on the unit, the buttons work and there is no interruption in audio. However, the grills do store a bit of water so there is a very minute difference in sound if considerable water is stuck. Further, for easier pairing, Element Force has NFC built-in. 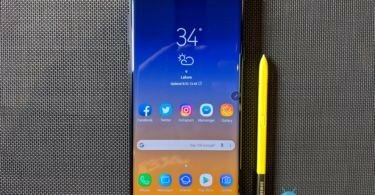 Basically, just by having NFC enabled on your device and tapping it on the speaker when its on, it will automatically pair. 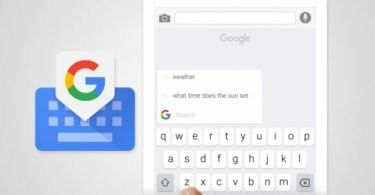 No need of seeking for devices through the bluetooth setting. Lastly, there is also a EQ button which activates unique EQ profiles. There are two main settings. One is a bit bass heavy while the other is focused on treble. 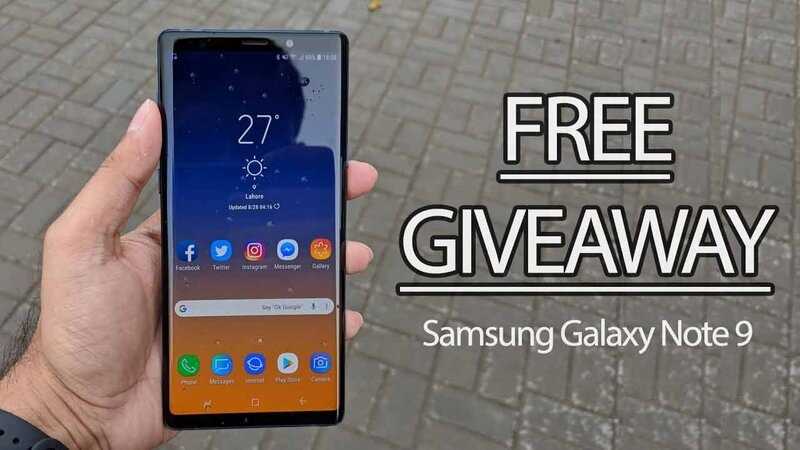 While this might not be helpful when you have your smartphone connected as they have advanced equalizing options built-in, it works well when you are playing from a microSD card that Element Force supports. 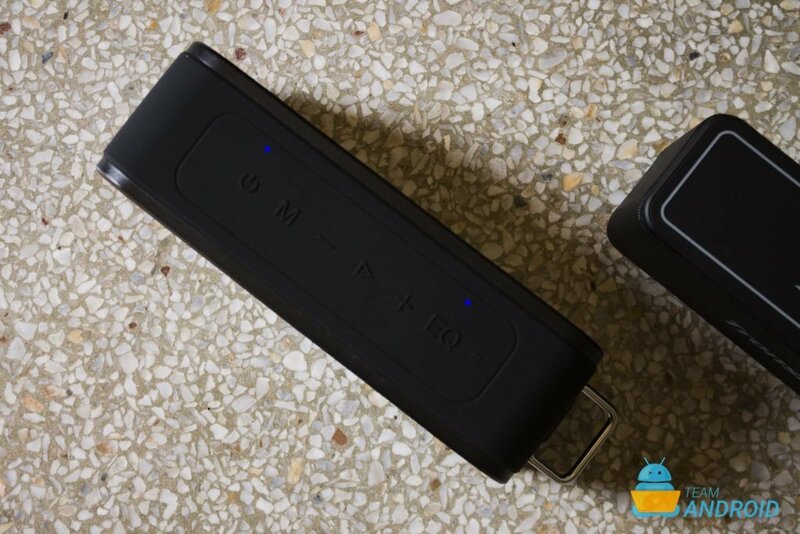 Similar to boomboxes of old, Tronsmart Element Force provides a comparable sound in a much smaller package and that too with a large battery that can easily survive more than 12 hours on a single charge. Also, the device is quite densely packed which gives it a very industrial feel and inspires confidence. The dimensions are slightly larger but in return, the sound is much more powerful. However, the weight is something to mention. As the speaker modules and battery cells are heavy components, Tronsmart Element force is carries considerable mass. 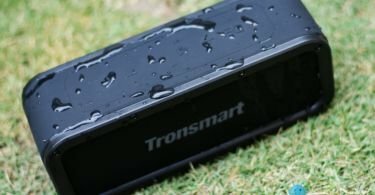 If you are in the market for a water-proof, high-performance speaker, Tronsmart Element Force is just perfect due its endurance, quality of sound, great build and a modern selection of I/O including USB Type-C. Weight and size, however, are few things buyers might have to consider when buying Element Force. 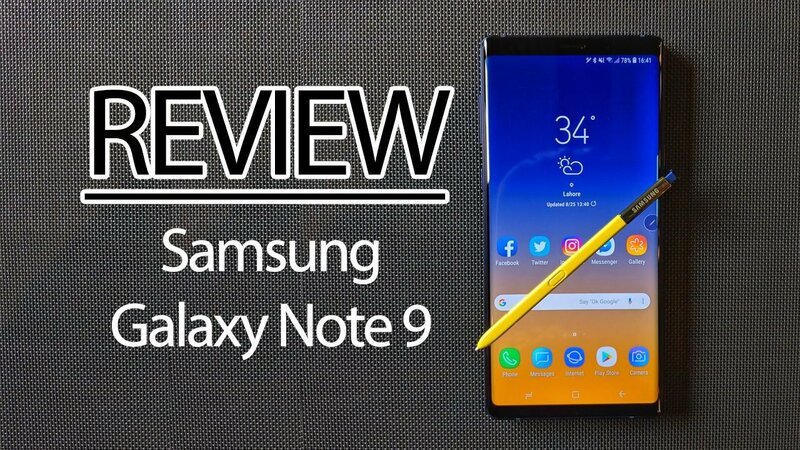 But for sure, if you settle for anything smaller, the sound would be compromised significantly hence this package, in our opinion, strikes a good balance.